Tri-Art Gloss Gel Medium is, in essence, high viscosity paint without pigment. Formulated from 100% pure acrylic polymer emulsion, it is white when wet and will dry to a glass-clear, glossy and flexible film. 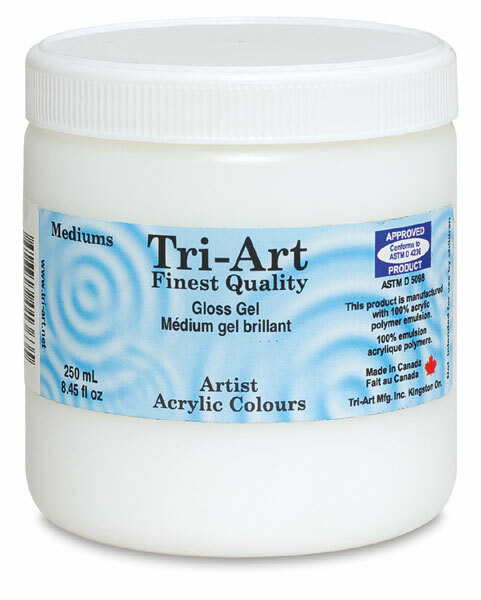 Tri-Art Gel Mediums have a creamy, buttery consistency and are capable of holding every texture detail from high peaks to a fingerprint. 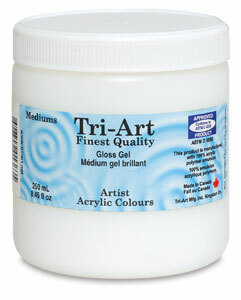 Even in very thick coats Tri-Art Gel Mediums will maintain optimal flexibility. An excellent colour extender or impasto glazing medium, Tri-Art Gel Mediums dry to a waterfast film which will not yellow with time. Their superior adhesive quality also makes them the ideal mediums for collage and mixed media. Matte Gel Medium — It maintains all of the properties of its glossy counterpart, but it produces instead a very matte and toothy finish. When mixed with Gloss Gel Medium, a full range of finishes can be achieved. Use it also as a photo transfer medium. Using a paintbrush or palette knife, apply the medium to any photocopied image, allow to dry, then wash the paper away from the dried gel film with lukewarm water. The ink will remain on the gel, which can then be bound to the painting surface.